After welding the cable wheel to the primary throttle linkage, I had to build an end-housing for the same linkage to mount it against the firewall. Also necessary was the clevis for the cable. Fortunately, I keep a lot of scrap metal sitting around, so it was pretty easy to throw something together. It's hodge podge, but it works. I'll eventually build something more permanent, but in the mean time, here are some pics. 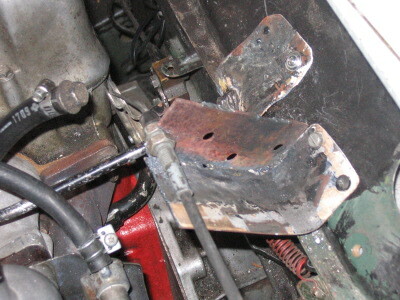 edwin - the bracket doesn't have to be on the engine - it just has to be stationary - connecting it to the upper part of the firewall seems to be fine. 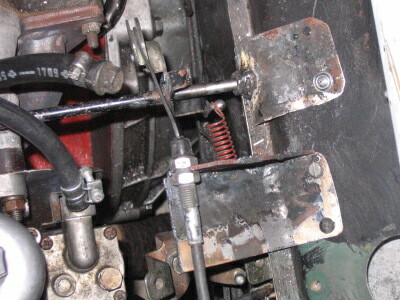 As for the cable to the gas pedal, the cable itself goes through a hole in the firewall, and a ball-connector (I don't know what it's called) connects to the top of the pedal. The pedal is on a lever, so that when you push it down, it tugs on the cable, which actuates the throttle. Hope that makes sense.